The global policy debate on tackling climate change is no longer about whether to take action. It is now about how much action to take and which actions need to be taken – and by whom. The global scale of the challenge in reducing greenhouse gas (GHG) emissions requires an equivalent and enormous financial and technological response. TNCs have an indispensable contribution to make in the shift towards a low-carbon economy, because they are significant emitters across their vast international operations, but also because they are in a prime position to generate and disseminate technology and to finance investments to mitigate GHG emissions. Inevitably, TNCs are a part of both the problem and the solution. For 2010–2015, one estimate indicates that $440 billion of recurring additional global investments per year are required to limit GHG emissions to the level needed for a 2 ºC target to be met (as referred to in the Copenhagen Accord). By 2030, the estimates range even higher, up to $1.2 trillion per year. All studies emphasize that the financial contribution of the private sector is essential for achieving progress in making economies worldwide more climate-friendly, particularly in view of the huge public fiscal deficits worldwide. To combat climate change, lowcarbon policies aimed at TNCs and foreign investment therefore need to be incorporated into national economic and development strategies. The current international climate change regime has not encouraged low-carbon foreign investment and related technology flows (particularly into poor developing economies) as much as was hoped for, despite recent increases. Following the Copenhagen meeting in December 2009, future emission targets, the nature of the institutions, concrete policy mechanisms and sources of funding continue to be unclear. The main international policy effort so far remains the Kyoto Protocol, the prospects for which are unclear. The current climate change regime is thus failing to generate what the private sector most needs in order to reorient its business strategies: a clear, stable and predictable policy framework. The Kyoto Protocol has been praised for creating mechanisms to reduce emissions, including the Clean Development Mechanism, which is also seen as a way to help developing countries achieve sustainable economic development. However, because the Protocol’s mechanisms were designed for compliance with emission reduction targets at the national level, this left individual governments to decide how best to involve the private sector in the process, thereby leading to fragmented markets. Today, it has become clear that “grand bargaining” is not enough, and that there is a dire need for rigorous mechanisms both at national and international levels to effectively mobilize the private sector’s contributions in terms of cross-border capital flows and technology diffusions, especially to poor countries. Introduction of low-carbon processes that reduce GHG emissions related to how products are made. This includes upgrading of TNC operations, and those of related firms along their global value chains. Creation of low-carbon products and services that lower GHG emissions in how they are used. Low-carbon products include, for instance, electric cars, “power-saving” electronics and integrated mass transport systems. Low-carbon services include rendering technology solutions by reengineering GHG-emitting processes in local companies. Channelling low-carbon foreign investment into key sectors (i.e. “areas of emissions”) with high mitigation potential is the most effective way of leveraging the contribution of TNCs to lower GHG emissions. Power, industry (including manufacturing as well as oil and gas), transport, buildings, waste management, forestry and agriculture are all major GHG emitters. An assessment of projected future emissions in these sectors, combined with their mitigation potential and cost, provides policymakers with a first indication of where their efforts should be concentrated. The power and industry sectors are the cornerstones of any global effort to reduce emissions. In both sectors, TNCs have a strong presence and are in a prime position to diffuse cleaner technologies and processes. Industry also provides equipment and services to help reduce emissions in other sectors. The transport, building and waste management sectors will each emit less than power and industry in 2030. For all three sectors, GHG emissions are to a large extent related to consumers and public use. In the transport sector, for instance, GHG emission reductions require more efficient vehicles and a change in consumer and corporate habits. In a similar vein, in the building sector, the use of improved appliances, lighting and insulation, as well as alternative power sources for heating and cooling, go a long way in reducing emissions. The waste management sector’s emissions result largely from waste landfills and wastewater, with potential mitigation largely about landfill methane recovery. The two land-related sectors, agriculture and forestry have high abatement potential; in the case of forestry one greater than its emission – due to potential afforestation and reforestation. To all these sectors, TNCs can make important contributions. Low-carbon FDI is estimated to have already reached a significant level, with flows of roughly $90 billion in 2009 in three key industries alone: (a) alternative/renewable electricity generation; (b) recycling; and (c) manufacturing of environmental technology products (such as wind turbines, solar panels and biofuels). These industries form the core of initial new low-carbon business opportunities. Over time, low-carbon investment will permeate all industries, for example as TNCs introduce processes to reduce GHG emissions. Looking beyond FDI, low-carbon foreign investment is – and will be – more significant, as it also covers non-equity forms of TNC participation such as buildoperate-transfer (BOT) arrangements. There has been a rapid increase in low-carbon FDI in recent years, though it declined in 2009 as a result of the financial crisis (fig. 7). Around 40 per cent of identifiable low-carbon FDI projects by value during 2003–2009 were in developing countries, including in Algeria, Argentina, Brazil, China, India, Indonesia, Morocco, Mozambique, Peru, the Philippines, South Africa, Turkey, the United Republic of Tanzania and Viet Nam. Established TNCs are major investors, but new players are emerging, including from the South. TNCs from other industries are also expanding into the field. About 10 per cent of identifiable low-carbon FDI projects in 2003–2009 were generated by TNCs from developing and transition economies. The majority of these investments were in other developing countries. (push factors) such as home-country policies, public opinion and shareholders’ muscle are increasingly weighing on TNCs’ decisions to invest in low-carbon activities abroad. Many of these drivers affect foreign investment in general, but a number are specific to climate change, for instance: (a) outward investment promotion measures in renewable energy for rural electrification; (b) policies that trigger the establishment of relevant technological capabilities, which are subsequently spread internationally; or (c) consumer pressure and shareholders’ demands leading to increased disclosure of climate change risks and opportunities. Locational determinants are host country-specific factors that influence TNCs’ decisions on where to set up operations (pull factors). Tailored policy frameworks and business facilitation are essential to attract low-carbon foreign investment. In addition to general determinants of foreign investment (e.g. market size and growth, access to raw materials, different comparative advantages or access to skilled labour), there are certain variations specific to climate change: market-creating or -defining policies can foster demand for new low-carbon products and services, particularly in the power, transport, building and industry sectors – and thereby draw in market-seeking foreign investment. Similarly, low-carbon technologies in particular countries can attract the attention of strategic asset-seeking foreign investors. As with any dynamic technologies, consolidation by M&A activity may occur in the low-carbon area; investors may also seek to participate in industry or technology clusters to gain knowledge from agglomeration and related effects. Developing countries are confronted with two major challenges in responding to climate change and moving towards a low-carbon economy: first, mobilization of the necessary finance and investment; and second, generation and dissemination of the relevant technology. Both are areas in which foreign investment can make valuable contributions. Nevertheless, developing countries need to examine the pros and cons of low-carbon foreign investment when determining whether or to what extent they should be facilitating it. When adopted, such a strategy should help improve production processes and the emergence of new technologies and industries. This can offer advantages over and above the benefits usually associated with the FDI package, such as leapfrogging to new technologies, particularly for the efficient use of energy and other inputs, as well as first-mover advantages and attendant export opportunities in key industries. A number of possible disadvantages need to be weighed against these benefits. Among them are the crowding out of domestic companies, technological dependency, higher costs for essential goods and services, and related social consequences. These are challenges that LDCs and other structurally vulnerable countries, in particular, are ill-equipped to meet alone. When promoting low-carbon foreign investment, policymakers need to consider the advantages and disadvantages, both in terms of economic growth on the one hand, and environmental, human health and sustainable development on the other, with a view to minimizing potential negative effects and maximizing the positive impacts. There is no “one size fits all” solution. Therefore, a policy mix in response to country-specific conditions is desirable. The following discussion is about policy options regarding investment promotion, technology dissemination, international investment agreements, corporate climate disclosure, international support and other relevant areas. Based on these considerations UNCTAD advocates a global partnership to synergize investment promotion and climate change mitigation and to galvanize lowcarbon investment for sustainable growth and development. This partnership should include, pursuing clean-investment promotion strategies; enabling the dissemination of clean technology; securing IIAs’ contribution to climate change mitigation; harmonizing corporate GHG emissions disclosure; and establishing an international low-carbon technical assistance centre to leverage expertise, including from multilateral agencies. Most countries have not factored in low-carbon investment attraction into their current investment policy framework and promotion strategies, as shown by a recent UNCTAD survey of national investment promotion agencies (IPAs). One important step forward would therefore be to integrate the potential role of low-carbon foreign investment into developing countries’ Nationally Appropriate Mitigation Actions (NAMA) programmes. In particular, it would mean putting in place policies to attract foreign investment which can contribute to the reduction of carbon intensity in traditional industries. It would also imply building upon emerging business opportunities for new types of low-carbon foreign investment, such as investment in renewables, and implementing proactive efforts to promote low-carbon investment. Creating an enabling policy framework. This includes the provision of adequate investment promotion, protection and legal security. Other supporting policies include the provision of incentives and regional integration agreements to overcome constraints of market size for low-carbon foreign investment. 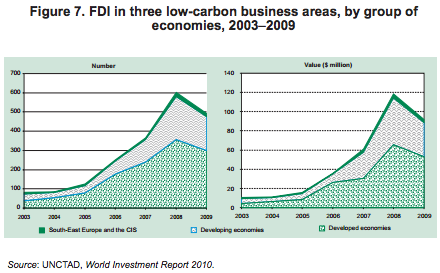 The emergence of new areas of low-carbon foreign investment – e.g. the production of renewable energy and associated products and technologies, fuel-efficient or alternative-fuel modes of transport and new building materials – is likely to require specific policies to complement the “traditional” elements of the policy framework. Foreign investment into new low-carbon industries may not be competitive in the start-up phase and may therefore need government support, such as feed-in tariffs for renewable energy or public procurement. In addition, such market-creation mechanisms are likely to require revisions to the regulatory framework, including the establishment of emission standards or reporting requirements. There is a need for capacity development in developing countries to enable them to deal with these complex tasks. Promoting low-carbon foreign investment. The promotion of low-carbon foreign investment also has an important institutional component. Governments need to identify opportunities for such investment in their countries and formulate strategies to promote it. Investor targeting, image-building, aftercare and policy advocacy are all key functions that national IPAs could use to this end. The latter should focus on specific economic activities when they spot a promising opportunity for developing domestic low-carbon growth poles and/or export potentials, and design a promotion package in those areas. The establishment of clean technology parks can facilitate the entry of foreign investors. IPAs can offer matchmaking services by helping low-carbon foreign investors to build networks and connect with local entrepreneurs. IPAs can also advocate national policies to strengthen a country’s attractiveness for low-carbon foreign investment. Technology targeting. A number of factors might affect host governments’ prioritization and targeting of foreign investment to boost prospects for technology dissemination. For instance, a government may identify targets for promotion efforts through an assessment of a country’s natural resources and created assets. In specific segments of industries and value chains, where the absorptive capacities of domestic companies are high but lowcarbon technology and know-how are lacking, governments can target specific foreign investors in order to acquire the necessary know-how. Such approaches have been taken by countries such as Malaysia, Morocco and the Republic of Korea. Creating a conducive framework for cross-border flows of technology. The key elements of a favourable environment for cross-border flows of low-carbon technology include availability of the requisite skills, appropriate infrastructure (e.g. some countries are setting up low-carbon special economic zones), measures to define and create markets in low-carbon products, targeted incentives (e.g. to invest in the necessary R&D or technology adaption) and a strengthened legal system. How these issues play out varies between economies; for instance, some developing countries have the resources to bolster education and training in the necessary skills. Another issue for cross-border technology flows into host countries is intellectual property (IP) rights protection. Foreign investors in some sectors consider strong protection and enforcement a precondition for technology dissemination, but the actual effects differ from country to country. Concerns have been expressed by developing countries that an IP regime should not only support IP protection and enforcement, but also guarantee greater access to appropriate technologies. Promoting transmission of technology through linkages. Domestic companies’ acquisition of technology from TNCs depends on the type, scale and quality of the interface (for instance, joint ventures or affiliate-supplier linkages) between the two. One option to foster linkages is to promote the establishment of local technological and industrial clusters. With the participation of both domestic firms and foreign affiliates, these clusters can help enhance the exchange of knowledge and manpower and the establishment of joint ventures between local and international companies. Boosting the absorptive capacities of domestic enterprises. Host developing countries should put in place strategies to develop domestic capacities to absorb and adapt technology and know-how. In this, government-driven research and development in “cuttingedge green” technologies can play an important role. There is scope for the establishment of regional technology synergy centres focusing on low-carbon technologies for developing countries as well as the industrial and other capacities needed to put this knowledge to work. Promoting technology dissemination may also require strengthening of the financial and entrepreneurial capacities of local firms. In this context, consideration should be given to the establishment of “green development banks”. Effective industrial and competition policies are key to tackling the negative effects of low-carbon foreign investment, such as crowding out and attendant dependency on foreign low-carbon technology suppliers. Industrial policies can help affected domestic companies to improve and upgrade; an effective competition policy framework can control the emergence of monopolies and prevent the abuse of dominant market positions. Social policies can also help to cushion employment impacts and other social consequences. For instance, re-skilling measures can help workers to adjust to new professional requirements or can facilitate their transition to emerging industries. For all this, poor countries will require assistance from development partners in the framework of a renewed global partnership for sustainable development. Attention needs to be given to the dual-edged nature of IIAs. On the one hand, by committing internationally to a stable and predictable investment policy environment and providing investment protection, IIAs can contribute to increasing a country’s attractiveness for low-carbon foreign investment. On the other hand, IIAs can possibly constrain the host country’s regulatory powers with respect to measures aiming to facilitate a transition to a low-carbon economy. Relevant awards by international arbitration tribunals suggest that IIA provisions pertaining to fair and equitable treatment and minimum standards of treatment, expropriation, and umbrella clauses aimed at stabilizing the legal framework for foreign investors merit particular attention. Numerous policy options exist to synergize the interaction between countries’ climate change and international investment policies, with a view to fostering a climate-friendly interpretation of IIAs and harnessing the potential of IIAs to ensure climate change-friendly effects. This includes novel approaches in future IIAs, such as strengthening IIAs’ promotion provisions with respect to low-carbon foreign investment, and redrafting and clarifying those IIA provisions that might lead to conflict with climate change-related policy measures. Policymakers may also wish to consider complementary, broader approaches. A multilateral declaration, clarifying that IIA parties are not prevented from adopting climate change-related measures enacted in good faith, could help enhance coherence between the IIA and the climate change regimes. The potential relocation of carbon-intensive production from highly regulated places to countries with less stringent or no regulation on emissions has raised concerns. There are fears that this “carbon leakage” – due to free riding – impedes global emission reduction efforts, and that such relocations of production may result in a loss of investment-related benefits (e.g. tax revenues and employment) in the home country. A debate has begun on whether to introduce border adjustment measures (e.g. tariffs) to deal with the issue of carbon leakage. There are technical difficulties when it comes to assessing the carbon intensity of individual imported goods, and there are doubts as to whether different types of border adjustment policies would be consistent with World Trade Organization (WTO) rules. In addition, caution is warranted for countries to guard against possible protectionism affecting efficiency-seeking and export oriented outward investment under the pretext of such carbonrelated policy measures. The extent of carbon leakage is difficult to quantify. Furthermore, due to different business-as-usual scenarios between countries, a new investment facility that is considered carbonintensive in one country could be regarded as low-carbon in another. For poor countries in dire need of expanding their productive capacities, such foreign investment could potentially generate large development gains due to the tangible and intangible assets associated with foreign investment. In the long run, however, it is in the interest of all countries to move towards an energyand input-efficient low-carbon economy. Instead of addressing the issue of carbon leakage at the border, it could also be addressed at its source. This would involve working through corporate governance mechanisms, such as encouraging improved environmental reporting and monitoring. Most notably, applying consistent emission policies across borders – including in host countries with laxer regulation – might generate economic and reputational benefits for TNCs. Regarding the economic benefits, consistency throughout a company’s integrated production system is not only in line with the logic of the value chain (thereby facilitating the implementation of corporate carbon policies), it can also help reduce production, monitoring and other costs. With respect to reputational benefits, such consistency in TNC action across jurisdictions would help brand the company as a “good corporate citizen”. In this context, improved climate reporting, particularly when undertaken in a harmonized and verifiable manner, can help ensure that a company’s reputation is based on solid ground. Further improving transparency in the marketplace facilitates consumers’ choices. A reliable internationally harmonized approach to measuring and reporting corporate climate change-related emissions is vital for the effective implementation and assessment of climate change policies (such as “cap and trade” schemes and carbon taxes), the internalization of climate risk into capital markets, and the monitoring of GHG emissions and clean technology diffusion throughout TNCs’ value chains. Climate-related management and reporting are common among large TNCs, but the information being reported lacks comparability and usefulness, and information on emissions by foreign affiliates and by value chains is often missing. Meeting the long-standing need for a single global GHG reporting standard requires a coordinated global response. Unifying the work of regulatory bodies, standard-setters and multi-stakeholder initiatives can strengthen and expedite efforts to create a single high-quality global standard for climate disclosure. The United Nations can facilitate this process by offering an established international forum: the Intergovernmental Working Group of Experts on International Standards of Accounting and Reporting (ISAR). Policymakers can demonstrate leadership on this issue by contributing to international efforts to harmonize climate disclosure, and by mainstreaming best practices in climate disclosure via existing corporate governance regulatory mechanisms (such as stock-listing requirements) and analyst tools (such as indexes). In their efforts to promote low-carbon foreign investment and harness TNCs’ technological potential, developing countries need assistance. Home-country measures can support outward low-carbon foreign investment. For example, national investment guarantee agencies could “reward” low-carbon investors by granting them more favourable terms, for instance in the form of a reduced fee. Another means might be credit risk guarantees for investments into developing countries. It would also be helpful if developed countries would increase their financial and technological support for low-carbon growth programmes in developing countries. The example of China and the EU, which have established a proactive and pragmatic climate change partnership with a strong focus on technology cooperation and the engagement of the business community, should be replicated. International financial institutions (such as the World Bank Group and various regional development banks) are actively engaged in supporting the move towards a low-carbon economy in developing countries. Their engagement should be geared towards furthering partnership approaches between the public and private sectors to help developing countries combat climate change, including by leveraging private engagement in high-risk areas without directly subsidizing TNC activities. Efforts should be made to further enhance international technical assistance for low-carbon growth in developing countries through cross-border investment and technology flows. An international low-carbon technical assistance centre (L-TAC) could be established to support developing countries, especially LDCs, in formulating and implementing national climate change mitigation strategies and action plans, including NAMA programmes. The centre would do so by leveraging the requisite expertise via existing and novel channels, including multilateral agencies. Such a centre could also provide capacityand institution-building in the promotion of low-carbon investment and technology dissemination.